Over the next two days, The Class of 2018 will walk across the stage to accept their degrees, marking the culmination of a rigorous academic journey. This year, students will have the honour of graduating during DAL200, a milestone year that celebrates Dalhousie’s 200th anniversary. 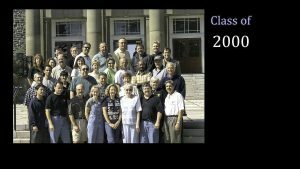 Eighteen years ago, the MBA(FS) Class of 2000 crossed the same stage, moving on to join a dynamic alumni community during the year known as Y2K. Year 2000 was the 1000th and last year of the second millennium, the 2000th year of the Common Era and Anno Domini designation. Year 2000 heralded the beginning of a new century and millennium. Amid the Y2K concern that computers would be unable to transition from 1999 to 2000 without significant and disastrous glitches, there was great optimism. Year 2000 was designated by United Nations General Assembly, with UNESCO, as the International Year for the Culture of Peace. Year 2000 was also named as the World Mathematical Year by The International Mathematical Union, an organization established by Kenneth O. May (University of Toronto) in 1969. The Class of 2000 continues to contribute within a world that has seen transformational changes in the way we connect across the world, from smartphones to social media, GPS apps to streaming. As new generations of graduates fulfill their academic goals, the Class of 2000 has moved forward to embrace mentoring, generously sharing and transferring knowledge and experience to an emerging workforce eager to accept the opportunities and challenges of their time.